One of my children received free camp tuition through US Family Guide in exchange for this post. I did pay for the other child to attend because they both wanted to. Any opinions expressed are my own. 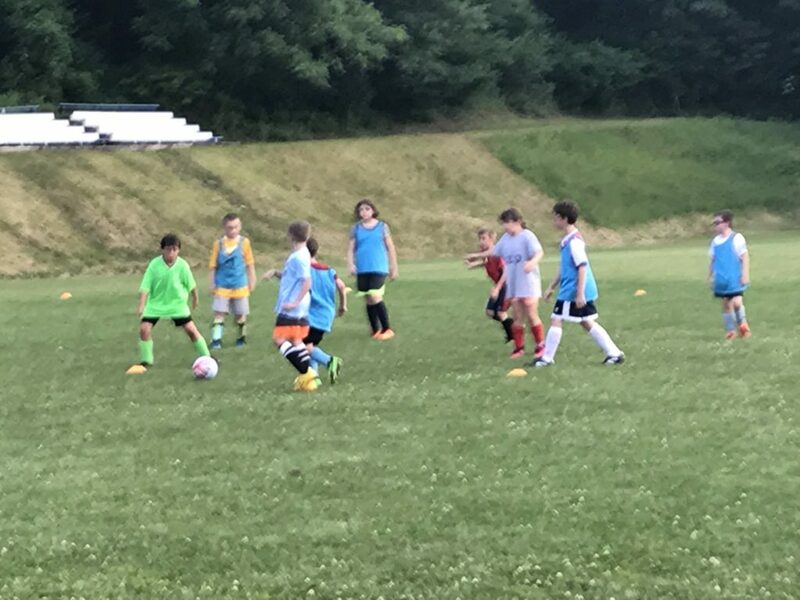 My littlest ones, ages 9 and 5, love soccer. They play in the AYSO league locally. 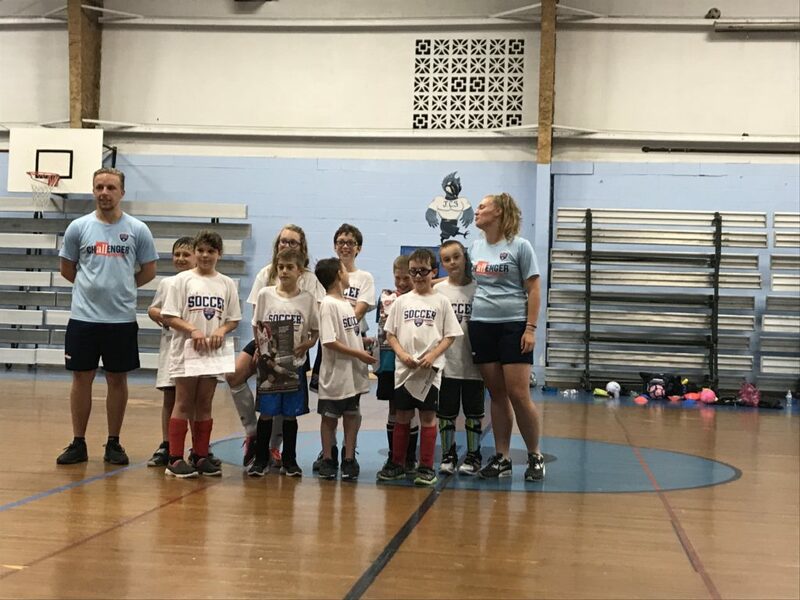 My oldest son also had the opportunity to play indoor soccer in the fall through a different league. Anything soccer, they are into it. 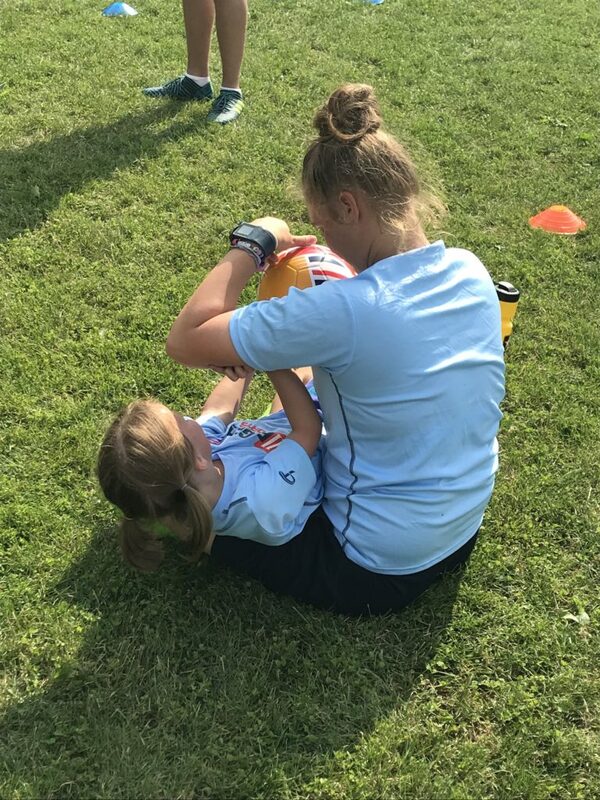 We had heard of Challenger Sports British Soccer Camp before but this is the first year we gave it a try. 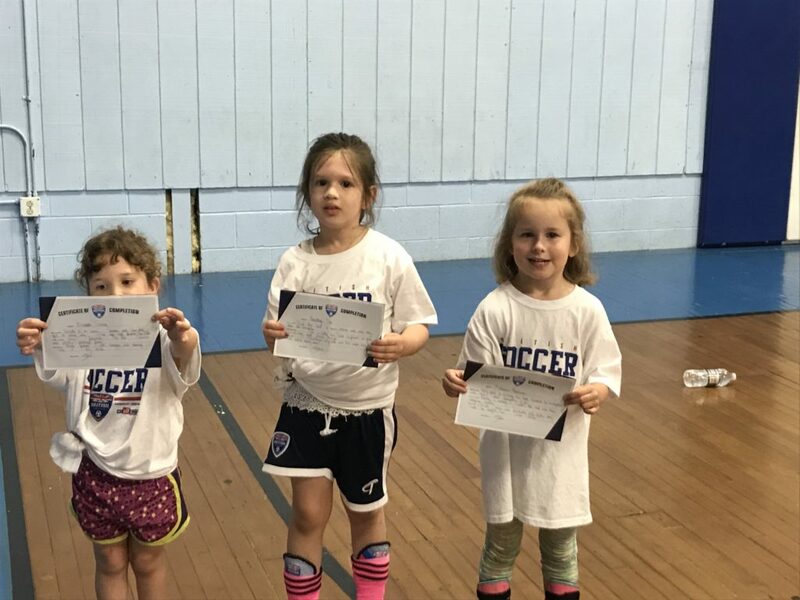 My daughter did the "First Kicks" program geared towards learning basic soccer skills for the little ones. She had a small group with only two other little girls but she made friends with these girls and had a blast. Every day when I'd get home from work she'd ask "Is it time to go to soccer camp yet?" First Kicks was only an hour long so it was a perfect program for 2- 5 yr olds. They got a lot of individual attention and coach Abby and Coach Jason knew them by name after the first day or so. 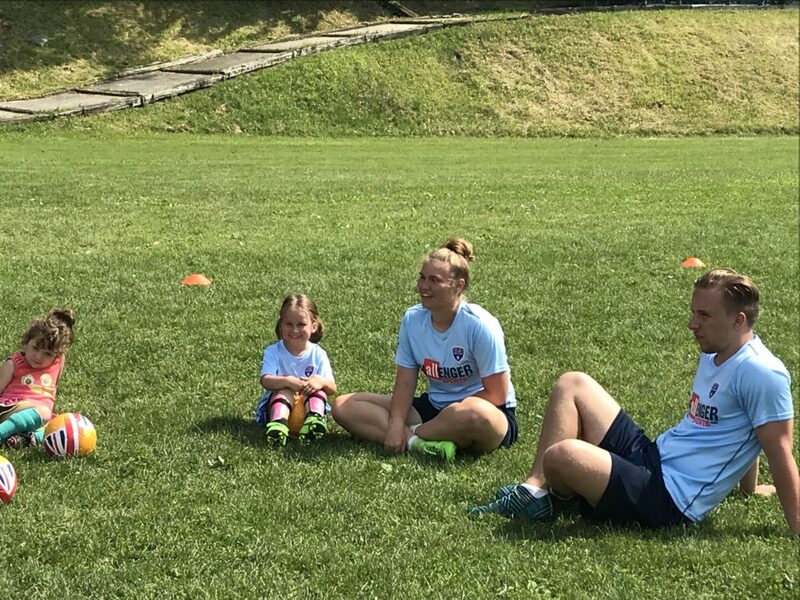 The coaches were so good with the kids and my daughter just loved them. My daughter is very outgoing and friendly. They answered her questions, listened to her stories and goofed around with her when she would try to play. My 9 yr old son did one of the half day camps. We chose the evening half day camp since it worked better with our schedules. My son is the opposite of my daughter personality wise in that he is rather shy and tends to keep to himself. But my son had already made a friend on the first day and he was just as excited to go back each day as my daughter. There were more kids in my son's age group with a mix of boys and girls. Kids from several different school districts were there so my son met a lot of new people. The older kids were also given homework. One night they had to research a country and give 5 facts about that country. 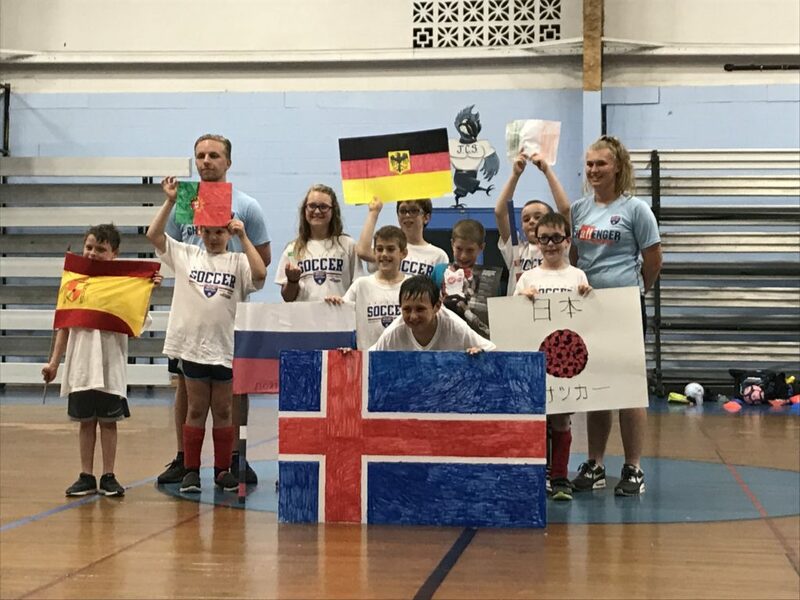 They had a to pick a country in the World Cup. Another night they had to make a flag for their country they chose. So they learned a bit too. The half day camp for the evening was 3 hours. They had so many activities, games, and skills to do with the kids that it seemed they were playing a few new ones each day. It was neat to see how the games incorporated certain skills of play. The first day of camp was super hot for us here in Pennsylvania. It was in the low 90s. After that it rained every day so they did the rest of camp in the school's gym that was hosting it. It didn't seem to matter to the kids one way or the other. At the end of camp they gave all the kids a certificate of completion with a hand written note of encouragement and it pointed out their strengths which was really nice. Because we registered early the kids got a British soccer camp soccer ball, T-shirt, and two different soccer jerseys. They also have access to the skills app. So if you ask me if the cost of the camp is worth it. I say, definitely yes. Learning new cultures, skills, making new friends, being active for 3 hours a day at least. So many benefits. There are still camps available. Check the site to see if there is one in your area. REGISTER FOR CAMP & GET A JERSEY, BALL, T SHIRT & NEW SKILLS APP AND 20 FREE VIDEOS!